Da begining Is Da Ending.. I've aready watch tis movie last 2 days wif ma besfwens Hawa.. so, for me..it was an awesome film.. 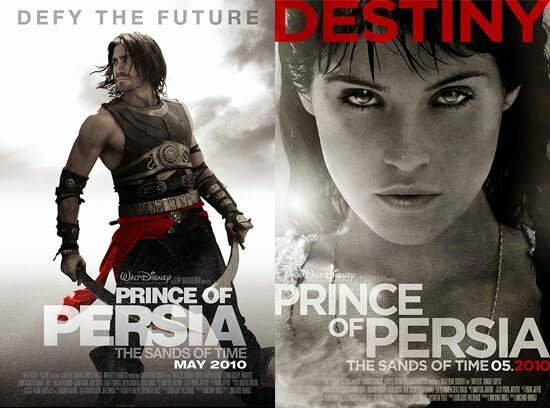 So i feel didnt waste da money 2 buy tickets & watch tis film.. Great.. credits 2 all da actor/actress & also da director Mike Newell.. Well done..
and Tus (Richard Coyle) plan battle strategies, a spy sends word that the Holy City of Alamut has been supplying weapons to enemies of Persia. Taking matters into his own hands, orders an attack on the sacred city and upon its fall Dastan encounters the beautiful TusPrincess Tamina (Gemma Arterton). When King Sharaman (Ronald Pickup) dies under mysterious circumstances shortly after, and Dastan is accused of his murder, he flees with the princess on a harrowing mission to clear his name. Learning from Tamina the true motives behind Alamut's invasion, Dastan must embark on a perilous quest to stop an evil mastermind's plot for ultimate power with a mystical weapon that can control the very fabric of time. And U know who actually kill their father??? Their own uncle nizam( Ben Kingsley)..
Unbelieveable.. Me was so resentful when see they r willing to kill their own blood to get the throne...So, what i wanna tell here da lesson tat we can get from tis story..
1st** Love.. Love between dastan & his adopt father, Between dastan & his brothers Garsiv & Tus.. Also between dastan & princess Tamana..
2nd*** willing to sacrifice life..
3rd*** Freinship.. Between dastan & Bis.. his Besfwens..
& many more lesson u cn get such as trusted between sibling & fwens, caring, Sacrifies, .. u can noe it when u wach tis..